The ultimate all-rounder suited to all soil types, all stock classes and many sowing times. A versatile, early maturing forage brassica, Winfred Forage Brassica is a cross between turnip and kale and an outstanding option for cheap feed. Winfred Forage Brassica is suited to a wide range of soil types and environmental conditions, stock classes and sowing times. Winfred Forage Brassica has exceptional drought tolerance, good frost tolerance and excellent regrowth potential. Winfred Forage Brassica flexibility allows it to perform well through summer and carry later into the season as winter feed is required. It has the potential for 2 to 4 grazing between early summer and late winter. 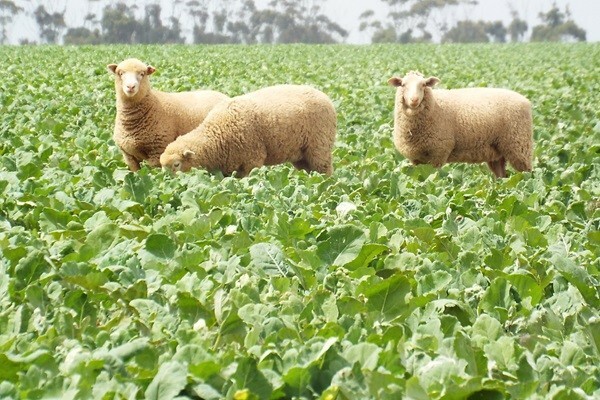 Winfred Forage Brassica is a good companion species and can be sown with ryegrass to provide quick feed after sowing. Winfred Forage Brassica can also be sown with other herbs and clovers – including Shirohie Millet, Tonic Plantain & Choice Chicory. Winfred Forage Brassica can be grazed 10 to 12 weeks after sowing. * There is variation in resistance to cabbage aphid depending on infestation, stage of growth and level of regrowth. All varieties are susceptible to green peach aphid and false cabbage aphid. Under fertile conditions many rapes do not suffer the extent of aphid damage if the plant is strong and well fertilised. Stressed plants are more vulnerable to aphid attack. Monoculture: 3 to 4 kgs/ha. Mixed with Herbs: 1 to 2 kgs/ha. Winfred Forage Brassica: 2 kgs / ha. with Knight Italian Ryegrass: 8 to 10 kgs / ha.